Is the Paramount Arts Center in Ashland, Kentucky haunted? 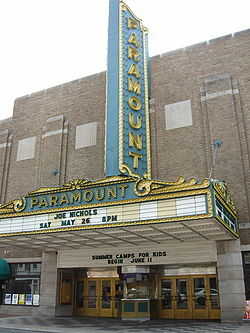 The Paramount arts center opening night was September 5, 1931. It was originally intended to show silent films made exclusively by Paramount Studios, but early during the planning stages, films with audio replaced the silent films. The theater was closed in 1971, and was picked up a year later by the Greater Ashland Foundation for use as a community theater. It was listed on the National Register of Historic Places in 1975 and remains as a theater to this day. It is said that during work on the Paramount Theater, in its early stages, a death occurred there and the man's ghost has forever since haunted the Paramount. A group of construction workers who were working inside the auditorium had gone to lunch except one man, a guy named Joe. When the others returned they found Joe hanging from the stage rafters, dead. It is not known whether his death was an accident or suicide. But since then, sounds have been heard, things have gone missing, cold drafts have been felt, and some folks even claim to have seen the apparition of a man appear on occasion. The ghost has come to be known as Paramount Joe, and he is thought to be a "good" ghost, By placing lost items plainly in sight and there is even a story of how Billy Ray Cyrus would talk to Joe and even ask for his help when he was filming his video for "Achy Breaky Heart".